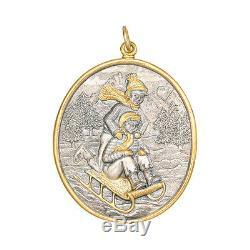 Winter sleigh ride Christmas tree ornament in sterling silver, with accents in yellow gold. Limited and numbered edition of 300. 3.2" length (3.5" including bale) and 2.5 width. Includes numbered Buccellati card of authenticity. The item "Buccellati Silver & Gold Winter Sleigh Ride Christmas Tree Ornament" is in sale since Tuesday, July 25, 2017. This item is in the category "Collectibles\Decorative Collectibles\Ornaments". The seller is "nolacloseouts" and is located in New Orleans, Louisiana. This item can be shipped to United States.